Apple Store Concierge Uniform T-Shirt. This is a brand new, never worn, Apple Store Uniform. 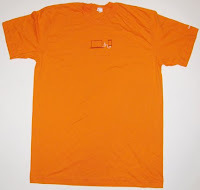 The t-shirt is orange, size Large, made by American Apparel. The front of the shirt has the icons of a Mac laptop and iPod touch while the back of the shirt says "Buy a Mac for college. Get a free iPod touch." in white lettering. The left sleeve has a white apple logo with the word Concierge.